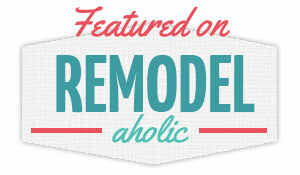 Have you ever started a DIY project thinking, "This will be fun!" only to realize 20 minutes later that you've chosen a tedious project that will completely test your patience? That was me on Saturday. "This will be fun!" quickly turned into, "Holy moly, this is going to take me forever. What was I thinking?" 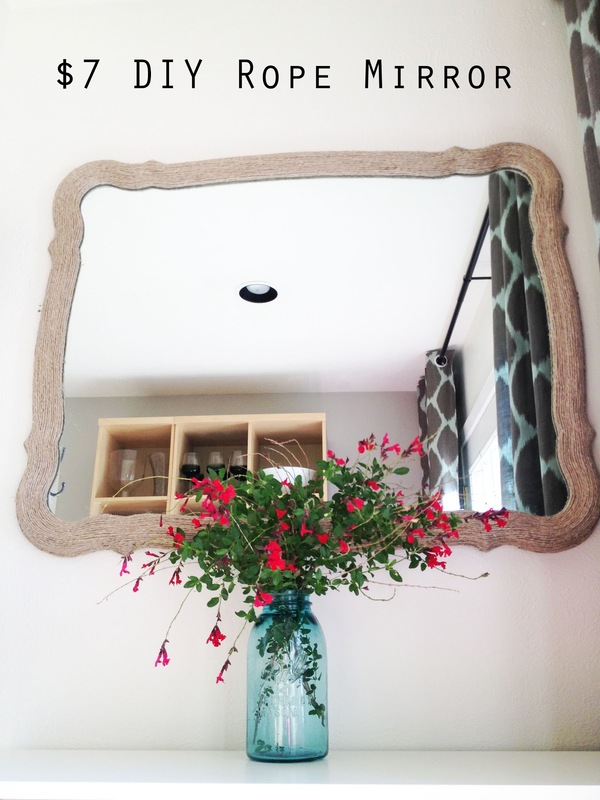 I ended up with a mirror that I really love, and thank goodness because it took me about seven hours of work! 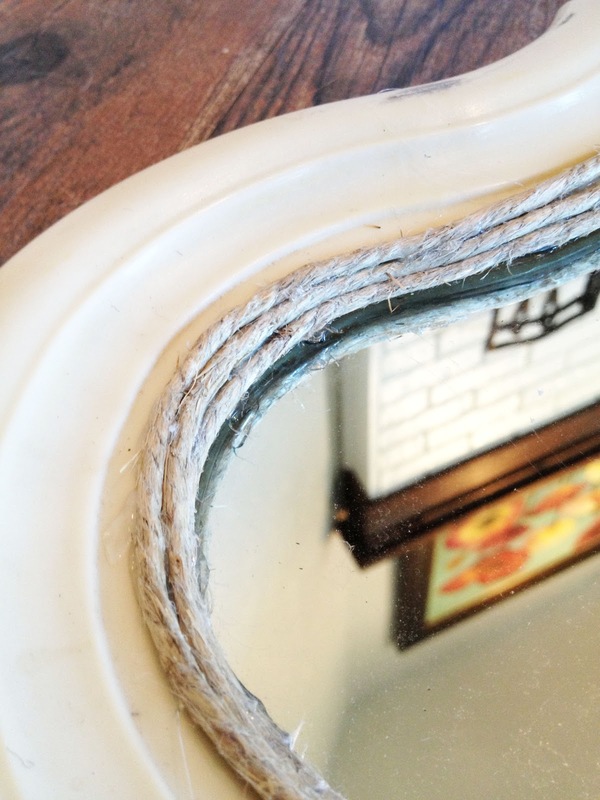 Here it is, my $7 DIY Rope Mirror! Ok, let's start at the beginning. I was inspired by these two Pinterest projects (#1 and #2) to spruce up this vintage mirror from the thrift store. 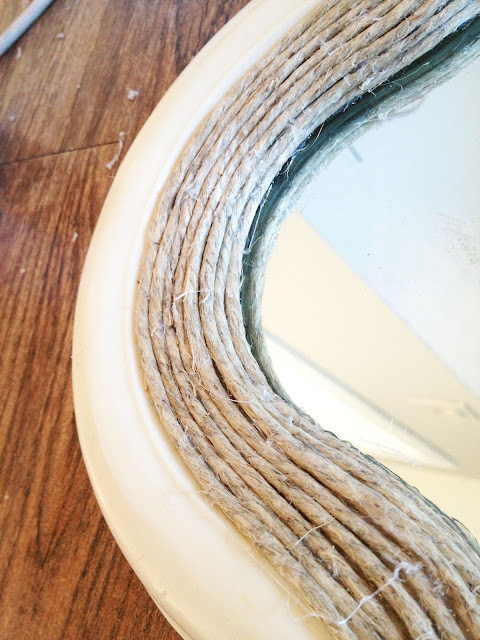 I checked a few hardware stores for different types of rope, but I thought its thickness might hide the great lines of the mirror. 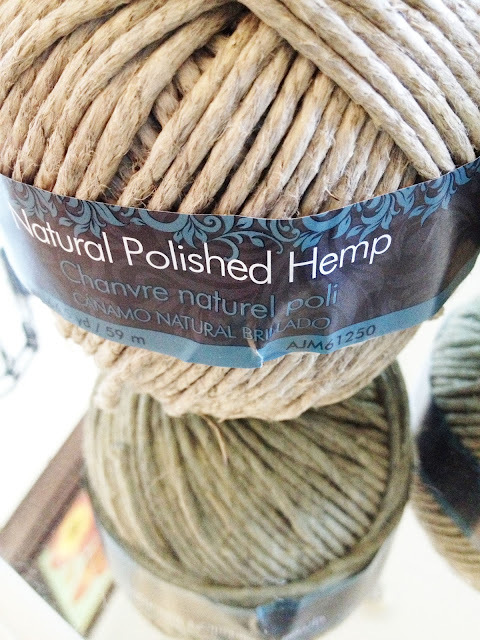 I ended up in the craft/jewelry section at WalMart, where I bought this roll of natural polished hemp. One of the reasons I liked it so much was because it had a nice weathered grey color that I'm totally attracted to, as opposed to some of the generic beige or white ropes colors I was finding at other stores. 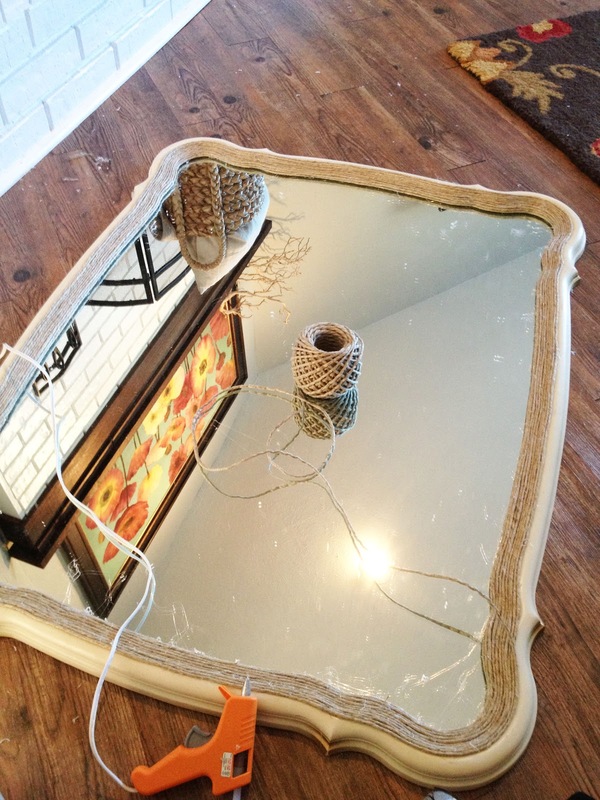 So I plopped down on my living room floor with my hot glue gun, the mirror and two rolls of hemp. Glue. Glue. Rotate. Glue. Glue. Rotate. Glue. My back was killing me. One can only sit Indian style on a hard floor for so long, you know? But I just kept on going– I was way too invested at this point. My mental pep talk: I've already spent three hours on this, and I'm not giving up now! Luckily I had an endless supply of college football to entertain me while I mindlessly applied hot glue. Halfway through, I had to bust out the Bandaids to take care of the blister on my hot glue gun trigger finger. Blister schmister, the DIY must go on! Early afternoon turned to evening, and I moved the project to the couch. The Florida/Georgia game was over, so I moved on to watching Notre Dame/Oklahoma. My DIY assistants were less than impressed with my project. I was really, really happy with the end result. 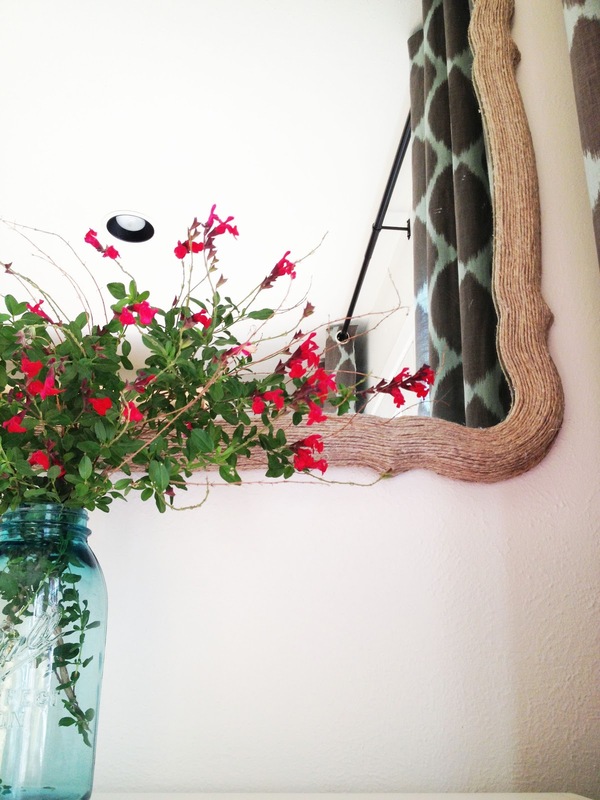 I think the mirror looks really expensive, and it reminds me of something you would buy at Wisteria or Pottery Barn for hundreds of dollars. This treatment allowed me to keep the curvy lines of the mirror while adding a textural element that I love. I'm all about texture these days! The finished mirror found a home by our back door, which is actually our main entrance since we park in the back of the house. 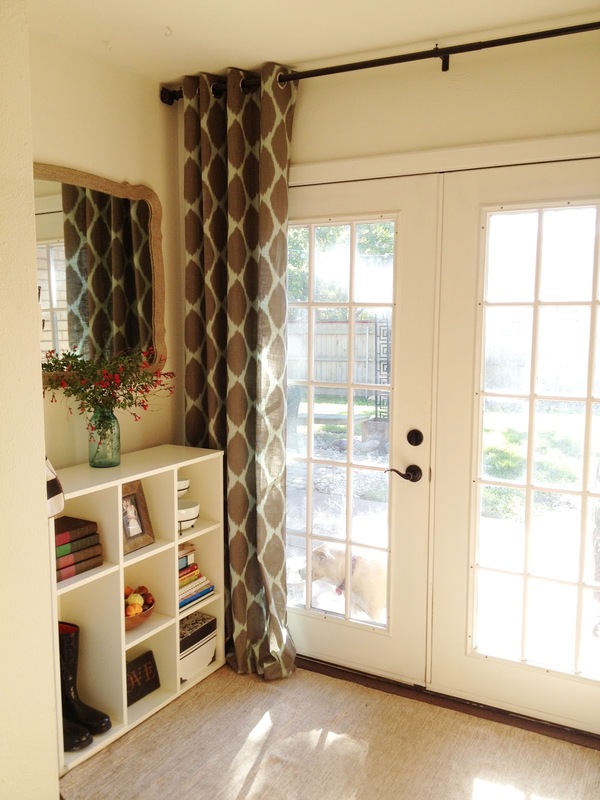 I love how it reflects the light from the french doors and makes the space feel brighter! 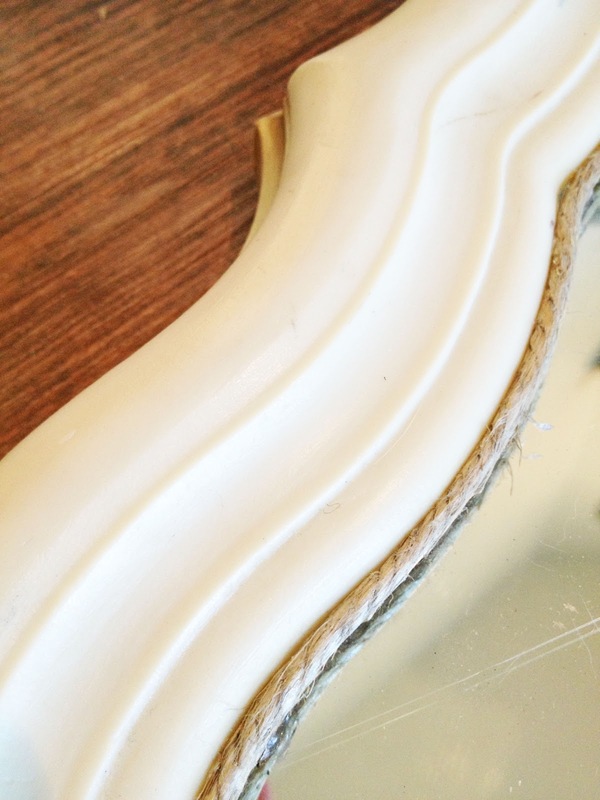 It did take me a really long time to finish this mirror, but there is something so gratifying about knowing that you made it yourself. I love that this mirror is completely one of a kind, and no one out there has the exact same thing. Mine, mine, MINE! Haha. In case you're wondering about some of the other stuff you see by our back entrance, you can check out these past blog posts for more info! 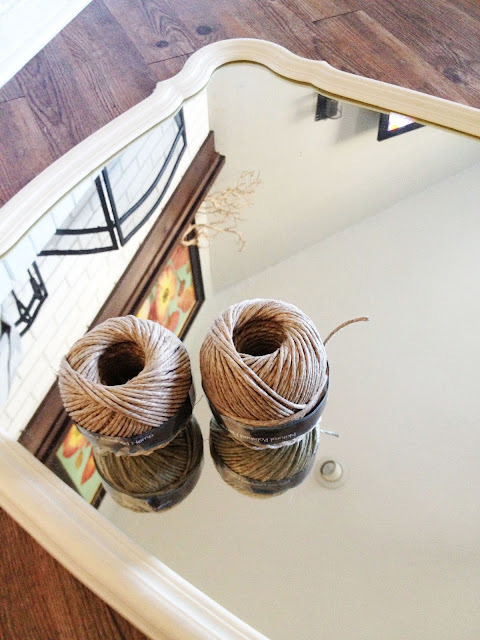 I'm linking this project up to the Fall Pinterest Challenge! 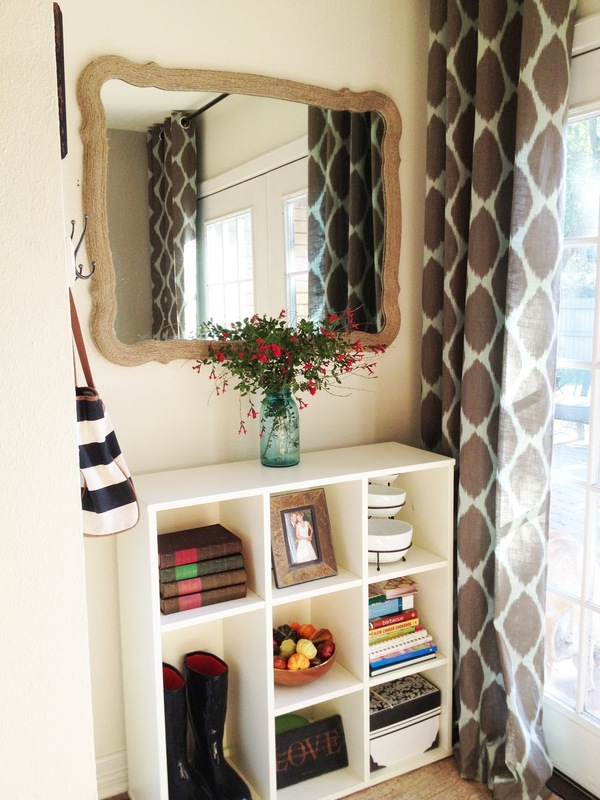 If you've got a Pinterest-inspired project to link up, you should join the party!